of London's households live in the private rented sector - the highest proportion since the 1970s. of new homes completed in the three years up to 2015/16 were "affordable". This was just 6,700 homes against a target of 17,000. Rents in Inner London in 2015/16 were 72% of earnings compared to 29% in the rest of England. Housing is central to understanding poverty and inequality in London. 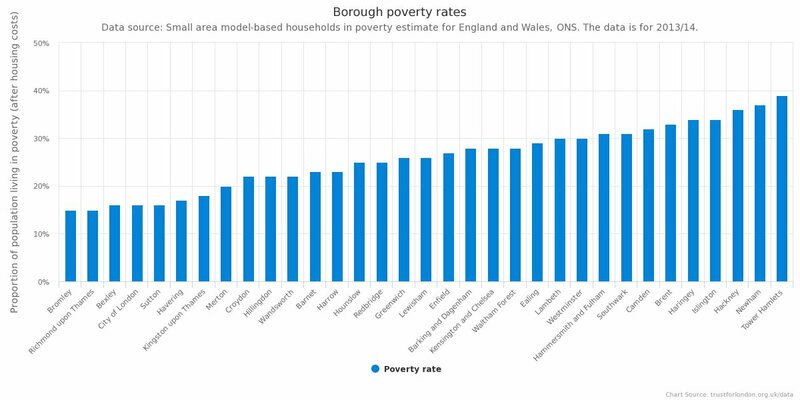 Housing costs push many Londoners into poverty and are a significant contribution to the fact that London's poverty rate is higher than in the rest of England. 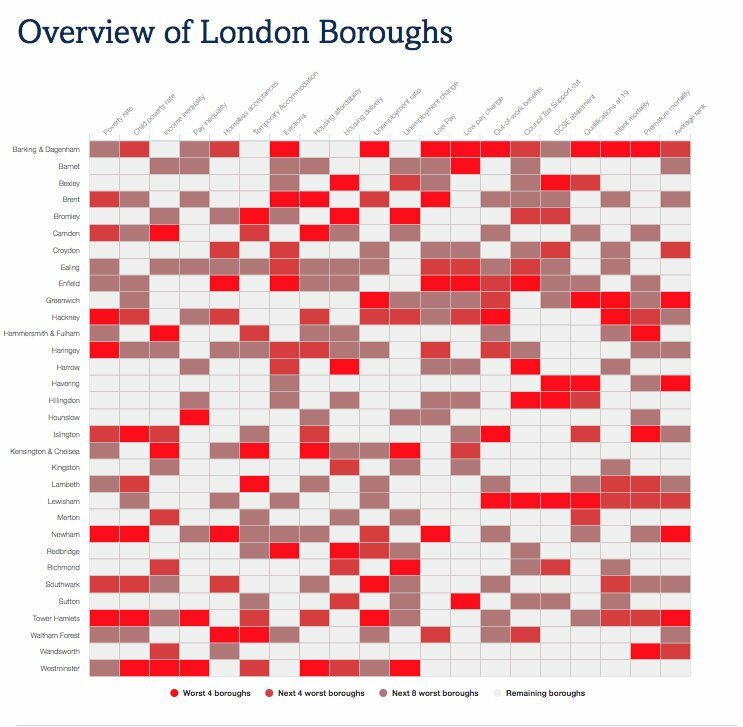 The indicators in this topic look at the nature of housing in London: the tenures people live in; the cost and quality of housing; and evictions. Average rent in London is more than twice the average for England, and has been increasing at more than twice the national rate over the last 5 years. The average lower quartile market rent in London is £1,250 per month, compared to £495 in England. The affordability of rent varies significantly between boroughs: Kensington & Chelsea and Westminster are by far the least affordable for low earners. Partly as a result, the number of people in the private rental market who are in poverty has risen enormously in the last decade. 447,500 private renters were in poverty in 2005/2006, compared to 962,000 now. More private renters now live in poverty than social renters (though, as a percentage, the proportion of social renters in poverty remains higher). 298,200 children in the private rental market were in poverty in 2015/2016. In 2005/2006, that figure was 106,600. Only 24% of housing completions in London were social or 'affordable rent' or shared ownership, in the three years to 2015/2016. This is a reduction from the three years to 2013/2014, when 34% of completions were affordable. It also masks enormous variation between boroughs from 1,830 in Tower Hamlets to a net reduction in two boroughs, Bexley and Harrow: as there were more affordable homes which were demolished or converted into other forms of accommodation than those which were built.